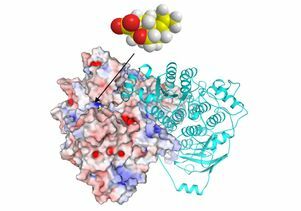 Image depicts an herbicide molecule (top), which inhibits an enzyme (bottom) that plants need. "The emergence of herbicide-resistance weeds is thwarting every herbicide class in use; in fact, there has not been a new type commercialized within the last 30 years," said Yan Yan, a UCLA chemical engineering graduate student who was a lead author of the paper. "We think this new, powerful herbicide — combined with crops that are immune to it — will complement urgent efforts in overcoming weed resistance." The study's third senior author is Jiahai Zhou, of the Shanghai Institute of Organic Chemistry at the Chinese Academy of Sciences. Postdoctoral scholar Qikun Liu of UCLA and Xin Zang, a researcher at Shanghai Institute of Organic Chemistry, were lead authors along with Yan. Other authors of the study are Shuguang Yuan, Undramaa Bat-Erdene, Calvin Nguyen and Jianhua Gan. The research was supported by an NIH Director’s Pioneer Award from the National Institutes of Health to Tang.